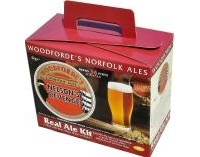 Woodforde's Nelson's Revenge (4.5%) is a Norfolk premium ale, named after Norfolk's most famous hero. It was brewed to avenge the invasion of 'foreign' beers into Norfolk! Woodforde’s Nelson’s Revenge has rich and floral aromas that initially excite the tastebuds. Then the following burst of flavours from the citrus hops together with the blend of Norfolk malt confirms that this is very much a delicious beer. The Nelson’s Revenge flavour then develops from the biscuity malt sweetness to a long hop-induced finish.